A man posted this on Instagram along with the caption, “My mother always told me there are only two types of women in the world…Those you marry and those you ‘date. '” Needless to say, I was mad for Amber Rose and tired of comments like this. For the last few weeks I’ve been thinking about respectability down to what it means for a woman to wear a certain color suit to an interview and risk not being respected because of it. I realized that respectability is largely in the eyes of the beholder and for women that beholder is usually men–but also sometimes other women. In this instance, the beholder is a black man–although quite a few black women chimed in to affirm the message of this image and his caption and, of course, his mother is the origin of this thinking. But there are so many problems with this respectability meme. 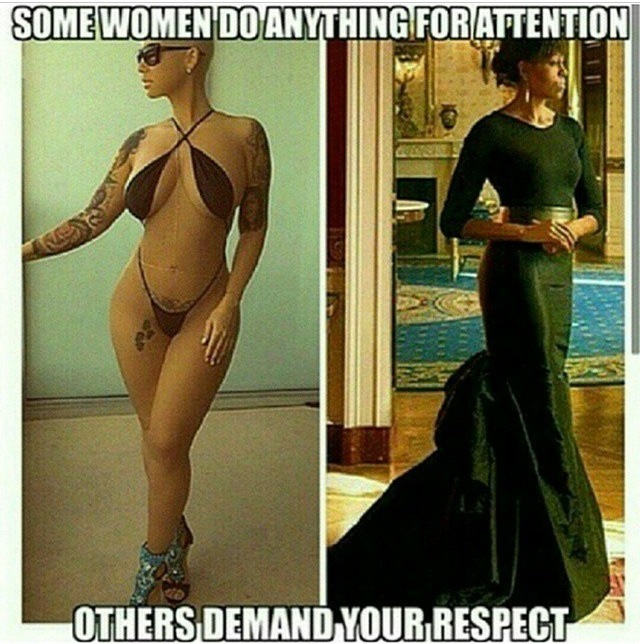 Yes Amber Rose’s livelihood comes from posting pictures such as her balcony bikini and for being a public figure who makes people clutch their pearls, but I don’t regard her as less worthy of my respect than Michelle Obama. If anything, I must constantly remind myself that my respect for her and women like her shouldn’t be based on what they wear but on who they are on a fundamental level–there’s a quote from a theologian or philosopher about loving human beings as ends and means but I can’t find it. And yes, I will address my “women like her” classification because I acknowledge the problematic nature of that statement. Who Amber Rose is, on a fundamental level, is a woman and a human being who deserves respect and regard before she puts a thread of clothing on. She is more than her body. I hate that man’s IG post and caption because it relies on the thought that a woman’s worth is in her presentation rather than other defining characteristics. It is dependent on making the body the primary site of respectability and for Amber Rose, being as endowed as she is, whether she wears clothes or not, her respectability will always be in question. Is Amber Rose not more than her body–even if all she shows us is her body? And that’s another issue, as people we struggle with issues of embodiment and women such as Amber Rose end up bearing the brunt of the struggle. But Amber Rose is not the only victim of the politics of respectability, even Michelle Obama, our current icon of black female respectability, has been criticized for wearing clothes that are too figure-flattering, revealing, or that are just too glamorous. So maybe we can’t win for trying. Unfortunately, that isn’t the case because there is still more room in the annals of respectability for Michelle Obama than there is for the Amber Roses of the world. I commend Amber Rose for deciding, day after day, to live out who she is in this moment and obey her truth instead of conforming. I commend her for her expression of her womanhood because that is just what this is, one woman’s expression of her womanhood. I want more people, not just men, to get in the habit of thinking about what is at stake when we judge the Amber Roses of the world. Or anyone else whose lifestyle leads them in a different direction than what we were taught is the respectable way–and I wish we could do away with respectability altogether. It will always be troubling to me that men, who have fewer options with which to present themselves, have the audacity to judge a woman who chooses to present and express herself in one way over the other. It is also troubling to me that a woman could tell her son that there are only two types of women in the world, the ones you marry and the ones you date. If I have a son I will never reduce women to an either/or. If I have a daughter, I will encourage her to find ways to express her womanhood however that feels natural to her–when she comes of age of course. She may grow up to be like Michelle Obama or like Amber Rose or like another woman who isn’t on the limited spectrum of women who represent respectability and non-respectability that the meme proposes. There are a lot of women between and beyond Amber Rose and Michelle Obama that a little girl could grow up to be like and all of them are worthy of the same respect and love.